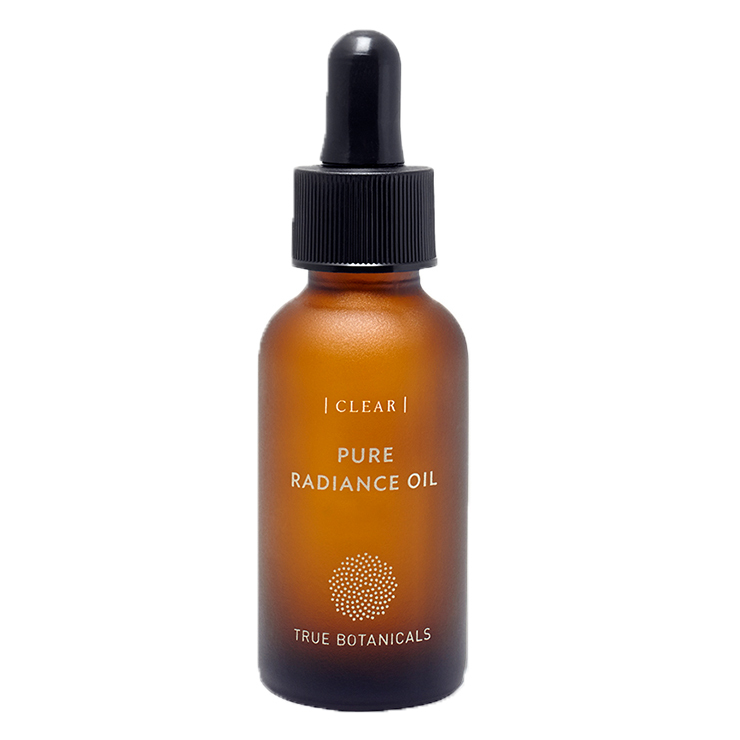 True Botanicals Clear Pure Radiance Oil proves acne prone skin benefits from natural oils. Formulated with helichrysum for clear looking skin with visible improvement in inflammation and scarring. Hemp, pumpkin, and grape seed oils lend a feeling of balanced oil production and reduce signs of congestion. Algae extract and astaxanthin offer healthy essential fatty acids to keep skin feeling hydrated and plump. This oil blend improves the appearance of acne and clogged pores for radiant looking skin. Use in place of traditional facial moisturizer for oily and acne prone skin. Apply 2-10 drops to clean, slightly damp skin, and gently press onto skin. May be used day and night for an improvement in the appearance of acne prone skin. Simmondsia Chinensis (Jojoba) Seed Oil*, Carthamus Tinctorius (Safflower) Oil*, Cannabis Sativa (Hemp) Seed Oil*, Cucurbita Pepo (Pumpkin) Seed Oil*, Argania Spinosa (Argan) Kernel Oil*, Vitus Viniferi (Grape) Seed Oil*, Borago Officinalis (Borage) Seed Oil, Persea Gratissima (Avocado) Oil*, Helianthus Annus (Sunflower) Seed Oil*, Crambe Abyssinica (Abyssinian) Oil, Sesamum Indicum (Sesame) Seed Oil*, Rubus Idaeus (Red Raspberry) Seed Oil, Vaccinium Macrocarpon (Cranberry) Seed Oil*, Squalene (From Olives), Tocopherol (Non-GMO Vitamin E), Citrullus Lanatus (Watermelon) Seed Oil, Silybum Marianum (Milk Thistle) Seed Oil, Algae Extract, Haematococcus Pluvialis (Astaxanthin From Red Pond Algae) Extract, Rosmarinus Officinalis (Rosemary) Leaf Extract*, Nigella Sativa (Black Cumin) Seed Oil*, Santalum Album (Sandalwood) Oil*, Lavandula Hybrida (Lavender) Oil*, Helichrysum Italicum (Helichrysum) Flower Oil*, Tarchonanthus Camphoratus (Leleshwa) Oil, Cupressus Sempervirens (Cypress) Oil. This is hands down the best facial oil I have ever EVER used. I mix a few drops with my Kjaer Weiss cream foundation and it goes on so perfectly. It absorbs quickly. It doesn't clog pores. I don't even know why I'm telling you this, it's only going to make it quicker to sell out :) I have thrown out all my other face oils, oh, except for True Botanicals repair oil which I use at night. There's no point in bothering with anything else. Ever. I hope there's not face oil (unless it's this!) in the monthly box, because, frankly, I have no use for it anymore. I like switching it up for so many other products. But if True Botanicals ever stops making this I'm in deep trouble.